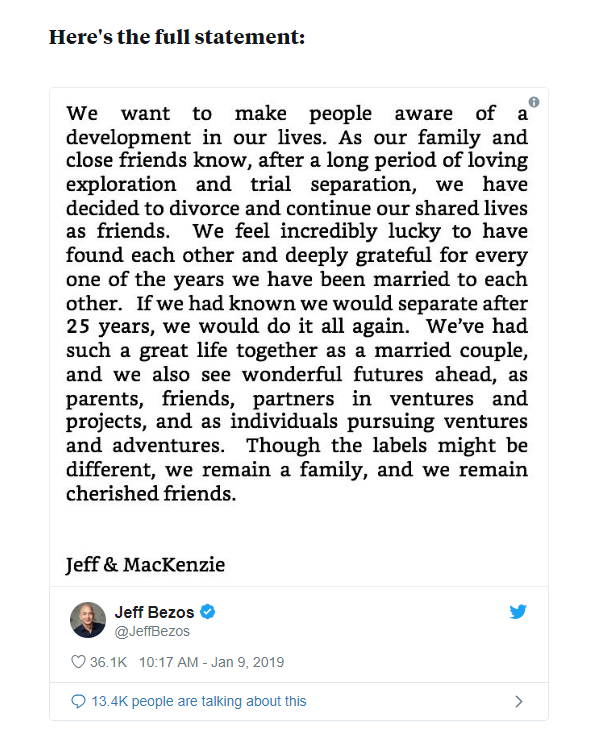 When Amazon CEO and founder Jeff Bezos announced that he and his wife, MacKenzie Bezos, were getting a divorce after 25 years of marriage, he did it via Twitter. A day later, the National Enquirer published salacious details of Jeff’s relationship with Lauren Sanchez, a pilot and former news anchor. The National Enquirer published that Bezos had been having an extramarital affair with Sanchez for eight months. The tabloid also published intimate text messages between Bezos and Sanchez . When Jeff Bezos told his then-wife MacKenzie about his idea for a new company, she was immediately on board. Bezos traveled with her husband to Seattle, where she worked for the Amazon as one of the first employees and as an accountant. Under Washington state law, if the couple files for divorce there, all assets and debts accrued during their marriage will be considered owned by both husband and wife. Jeff Bezos is the largest shareholder of Amazon, owning 16% of the shares. This immediately concerned shareholders and Wall Street for months because Jeff’s ownership and voting rights could be diluted as a result of the divorce. 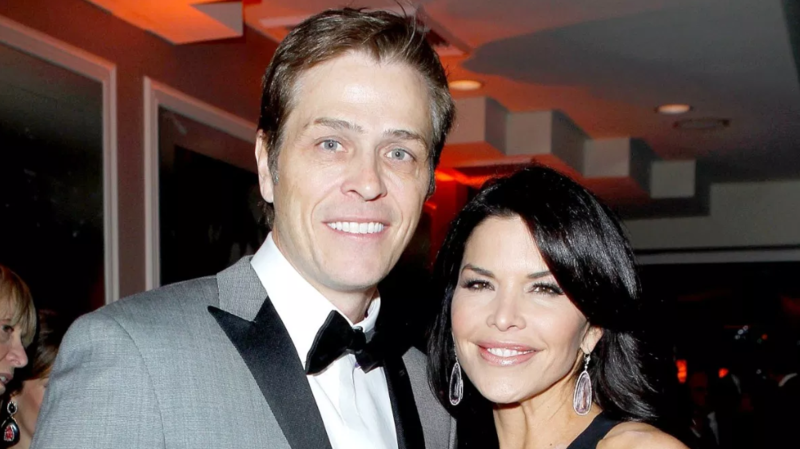 However Jeff and MacKenzie, said on Twitter on Thursday that they had finalized the details of their divorce. 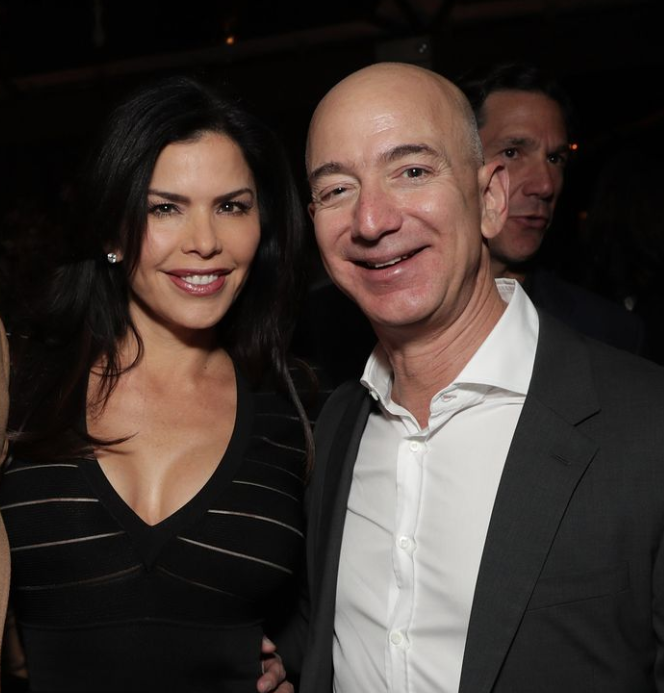 Jeff will keep 75% of the couple’s Amazon stock and all of their ownership of The Washington Post and the Blue Origin space company and sole voting authority at Amazone. MacKenzie will own roughly 4% of Amazon, a stake that was worth almost $36 billion…not bad for 25 years of dealing with Jeff. NOTE: I didn’t really know MacKenzie, but my respect for her only increased, as things could of been uglier. 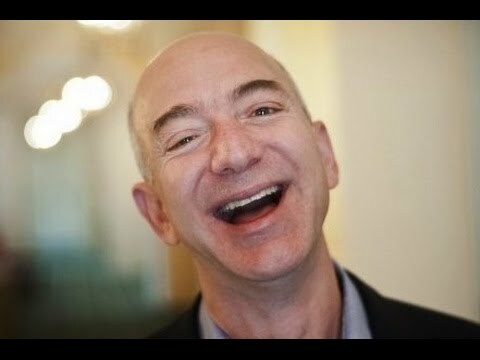 In the end, Jeff is keeping the company and the girl and shareholders are happy because Jeff will continue to lead and control Amazon. So where can we expect Amazon price to head next, lets go to the charts?